Hightex (80% owned by international businesswoman Yelena Baturina) will join the contracting team, comprising Italian company Cimolai, and Salini Impregilo, for the Al Bayt Stadium work. German company located in Bavaria secured a huge contract as they are to produce the largest membrane roof and facades In Qatar. The Italian general contractors selected Hightex due to its extensive experience in membrane construction for stadiums. A total of 200,000 m2 of the stadium's roof and façade will be covered in a lightweight membrane structure, which makes it one of the largest membrane-covered structure in the world of sport. 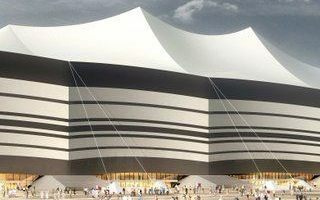 Hightex founder and CEO Klaus-Michael Koch said: "The stadium in Qatar will resemble traditional Bedouin tents with its extraordinary colour design. The membrane fabric will be specifically printed in traditional colours and patterns." As a reminder, Al Bayt Stadium was initially designed to resemble a mostly-black tent. However, after tests on the site it was decided that the primary colour should be white to help cool the building down. It’s currently one of the most advanced constructions for the Qatar World Cup and should be ready for use in the second part of 2018.